The Maher Cup | Did Jack Watson Make The Most Maher Cup Appearances? Jack Kingston (at least 50 appearances from 1925-1932). This renowned international lock forward who toured with the Kangaroos to Britain in 1929, was a Cootamundra lad. He also had a stint as captain-coach for arch-rivals Young. Outside the Maher Cup world he also played for Leeton, Nowra and Western Suburbs. Gordon Hinton (52; 1926-1932). Originally from Gunnedah, Lindsley Gordon Hinton was a regular second row forward in a very settled and highly successful Cootamundra team. He also tried his hand at boxing and at swimming before settling as a fireman in Sydney. He suffered from a kidney injury that compromised his potential. Gordon Hinton died in 1996 and is buried at Cootamundra. Leslie Thomas ‘Dadie’ Quinlan (55; 1922-27). From a farming family at Yathella, Dadie Quinlan also played as a forward in Phil Regan’s ‘unbeatables’. He served in the Great War and was 30 when he participated in his first Cup clash. He never married and quietly worked as a general hand at Cootamundra’s Sacred Heart Hospital for many years. He passed in 1961. Eric Kuhn (55, 1953-1968). From a farming family at Weethalle in the mallee country, Eric was enticed to ignore the local club, West Wyalong, and play for Barmedman. Under Keith Gittoes the littlest village in Maher Cup Country enjoyed a most successful Cup run in 1955 – with young Eric becoming a star half back. In 1957 Harden started to build a powerful team and signed up the ‘The Mighty Atom’. He was an essential ingredient in the most successful Maher Cup side ever. Eric later coached and still resides in Harden. Col Quinlan (58 at the very least, 1945-1966). The driving force within the feared Barmedman forward pack – dubbed the Clydesdales – ‘Guts’ Quinlan just kept playing on and on. It is likely that he participated in up to a dozen more games than the 58, as Barmedman team records are less complete than other towns. This is due to there being no newspaper published in the village since the 1920s. Bill Kearney (62, 1933-1946). Club captain, coach and official, successful businessman, radio broadcaster, publicist. Kearney was a most effective captain and a deft kicker, who played and led during Young’s most successful footballing period. He was a big personality remembered by all, mightily respected, but not always loved. Lionel ‘Nicky’ Cullen (64 and probably a few more, 1950-1970). A railway worker from the largely forgotten locality of Aurville, who played for over two decades for Harden with remarkable resilience and consistency. According to Eric Kuhn he was one of only two players who participated in every match in Harden-Murrumburrah’s amazing 29 Maher Cup streak from 1958-1960. He later coached local teams and still lives in the area. Ron Crowe (64, 1951-1971). If he wasn’t so good we would have played more. Scores of representative games for group, region, state, country as well as commuting to South Sydney during 1962, kept him away from many Maher Cup games. The Cup petered out in the late 60s but ‘Dookie’ Crowe was still able and available for West Wyalong and Barmedman will beyond its demise. Eric Weissel (65, 1922-1934). I believe the brilliance of Ec – ‘The Wizard’ – on display most winter Wednesdays at Cootamundra in the 1920s probably did more than anything else to enshrine the Maher Cup with legendary status. Although he spent all his life in the Riverina, representative games and international duties frequently took him away. Further the vagaries of the Maher Cup draw resulted in his adopted club of Temora being granted no challenge for two years between July 1927 and July 1929. Instead they turned their attention to other challenge cups in play, particularly the Jack Hore Gold Cup, while Temora created their own Eric Weissel Cup – which is still in play. Bill Lesberg (65, 1922-1931). It’s quite amazing that Lesberg aged 28 when he played his first Maher Cup match for Cootamundra, still had time to amass at least 65 appearances. Victorian-born his winter sporting interest had initially been Australian Rules – where he developed his phenomenal kicking skills. Long, accurate, both placed and dropped goals (when the latter was worth two points), often from ridiculous angles and with either foot, resulted in ‘Berg’ being the Cup’s undisputed highest point scorer of all time. So frequently was his foot the difference. Like most of the men in this list, railwayman Lesberg worked and then lived his retired days in Maher Cup Country. Sid Hall (66, 1925-1945). A brilliant centre for Young, Sid Hall declared his retirement from the game aged 31, in 1933. The next year we was back as the teams’ captain-coach. Not even the hiatus of the war years wearied him – he was part of a highly successful Cherry-pickers’ Maher Cup side that reformed in 1945. He did retire at 43. J. Watson (79, 1923-1932). With a full 13 appearances more than the next man one would think that J. Watson of Cootamundra, would be, like the others in this list, well-known to aficionados of Group 9 Rugby League history. Not so. Jack Watson is the 3rd player from left in middle row. Jim Watson is 2nd from right in the same row. The first question about J. Watson is whether he was Jack or Jim. Both played football for Cootamundra. The problem is that newspapers of the time, and particularly the Cootamundra Herald, rarely noted a player’s given name. If necessary they may begrudge an initial. When they did list the actual given name it was usually to distinguish two people with the same surname and same initial. However there were no two J. Watsons in any particular Maher Cup side although they are both in the picture above. 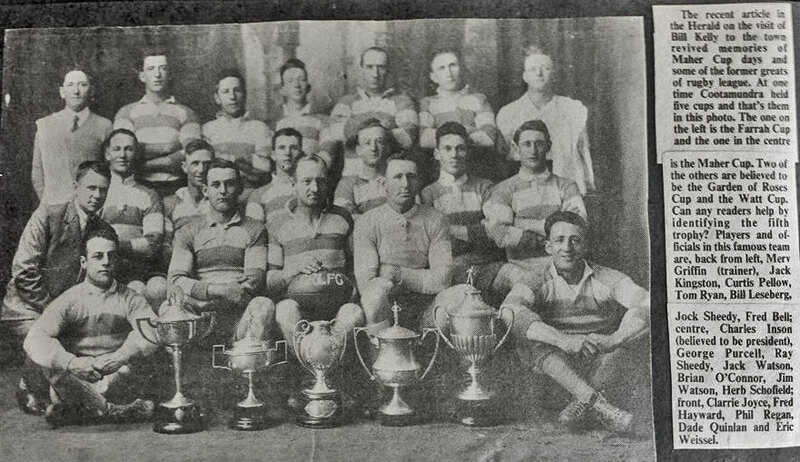 I believe this is from 1926 and would probably include all the men who played for any of the five cups shown. In those rare occurrences where J. Watson was spelt out, it was usually ‘Jack’. We was more often associated with top level football. He captained the team in 1931 in the absence of Jack Kingston. He scored a memorable try on the bell, some say after the bell, on 24 July 1929 for Cootamundra to regain the Cup from Junee before a near-record gate. In the only team list found where both Watsons actually played in the same match, it was not a Maher Cup match. The report read that “main objective of this game” was to “unearth some young blood”. “Jacky Watson played well” [while]…”Jimmy Watson…“was not very conspicuous‘. 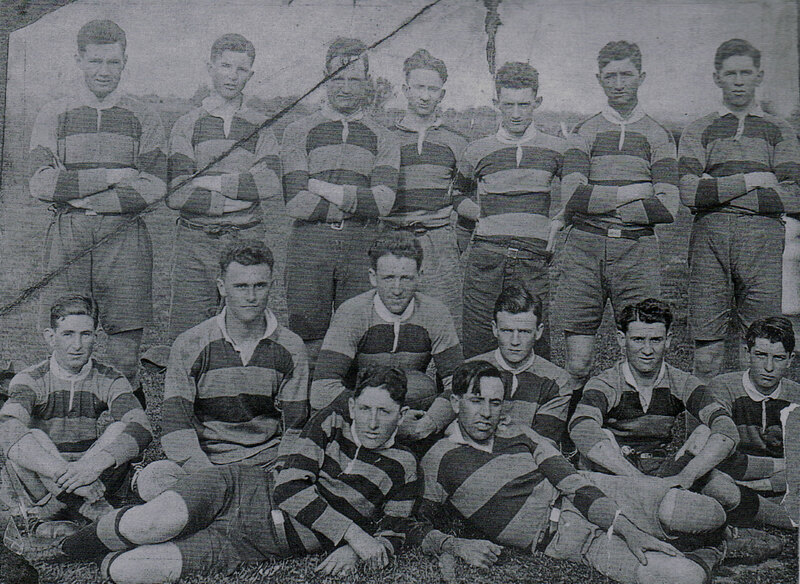 Jack Watson standing second from left in Cootamundra Junior Rugby League team on 1921. Eric Weissel is the man crouching. I believe that the J. Watson that played in at least 79 Maher Cup matches was Jack Watson – that he is the record holder, and that he was born in the Hay district in 1905, left Cootamundra shortly after his playing days and died a labourer at Dulwich Hill in Sydney, in 1955. I would like to know more. This entry was posted in People and tagged Abe Hall, Bill Kearney, Bill Lesberg, Col Quinlan, Cootamundra, Dadie Quinlan, Eric Kuhn, Eric Weissel, Gordon Hinton, Jack Kingston, Jack Watson, Jim Watson, Nick Cullen, Sid Hall. Bookmark the permalink.